We have three types of Instruction Manuals that Kent Bergsma has produced to help you repair and maintain your Mercedes. Each of the different types are described below with direct links to view a list of all subjects covered in each type. PDF Manuals are not printed and shipped to you. Rather, they are downloaded to your computer. You will reconize one when you see the BLUE PDF icon on the cover as shown below. Once purchased, they are available for viewing in your Mercedessource.com account. You are allowed three downloads per each purchase. 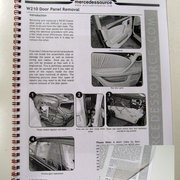 All PDF Manuals are also available in a printed form if you would prefer. On Demand Video Instruction Manuals are not available in any other format. When we make a video detailling a repair or maintenance procedure we do not cover the same information in a PDF or Printed Book. Once you complete the purchase of a video you will be able to view it immediately when you are logged in and on your personal account page (click on My Account). The video(s) will show up under My Video Manuals. The video is NOT downloadable to your computer or mobile device, but you will be able to view it anytime, from anywhere and from any device as long as you have internet access and you are logged into your account at mercedessource.com.